Sometimes pitchers will be in the hitters part of the write-up and vice versa. This is simply done when one side of hitter or pitcher is dealt for each other. Just who is Dexter Fowler? For his career totals, he has a 3 Slash Line of .298/.395/.485 in Coors Field, and his Road numbers were .241/.333/.361 before coming to play for Houston. Having said this he will definitely help out the Houston Astros with their offense. The Rockies also won’t have to pay him for his 3rd Year of Arbitration (Super 2). Fowler makes $7.35 MIL this year and is slated for one more year of Arbitration in 2015 before he is a Free Agent in 2016. Fowler has 7 hits in his 1st 17 AB for his new club with a HR. He should be playing every day in the OF going forward. Shout out to Ryan Dunsmore (@d_more55 on twitter) of the Crawfish Boxes for photoshopping Dexter Fowler into an Astros uniform. Like how Dexter Fowler was acquired for Jordan Lyles. Dexter Fowler (28) CF: December 3, 2013: Traded by the Colorado Rockies with player to be named to the Houston Astros for Brandon Barnes and Jordan Lyles. Jordan Lyles (23) SP: Drafted by the Houston Astros in the 1st round (38th pick) of the 2008 amateur draft. Brandon Barnes (27) CF: Drafted by the Houston Astros in the 6th round of the 2005 amateur draft. So far the player to be named later that came with Fowler has not been revealed. This may end up working for both clubs. Lyles looks great in Colorado, and with so many great youngsters coming in, Barnes was expendable. Lance Berkman spent from 1999-2010 with the Houston Astros amassing 326 HRs and 1090 RBI with a stat line of .296/.410/.549. He was never able to put up numbers like this anywhere but Houston. His chain of trades with the Asset have seen the club now have Chris Carter. CC had 29 HRs and 82 RBI in just 506 AB last year, and is also under team control until after the 2018 season. Chris Carter (27) 1B/DH/OF: February 4, 2013: Traded by the Oakland Athletics with Brad Peacock and Max Stassi to the Houston Astros for Jed Lowrie and Fernando Rodriguez. Mark Melancon (29) RP; July 31, 2010: Traded by the New York Yankees with Jimmy Paredes to the Houston Astros for Lance Berkman. Jimmy Paredes (25) RF/3B/2B: November 4, 2013: Selected off waivers by the Miami Marlins from the Houston Astros. Lance Berkman (38) OF/1B: Drafted by the Houston Astros in the 1st round (16th pick) of the 1997 amateur draft. Max Stassi (23) DH/C: Still with the team in the organization. Brad Peacock (26) RP: Currently in Astros Bullpen for 2014. This one is virtually now Berkman (who was never the same after leaving Houston) for Chris Carter. Lowrie was part of that Melancon deal, and has fared well in Oakland, but I love Carter’s power (29 HRs last year). Who else saw Melancon breaking out for the Pirates last year? He was brutal for the Red Sox. Peacock is also in the Bullpen, and Stassi in the Minors. The Big Puma has since retired. you factor in Lowrie will probably go somewhere else after 2014, and this is a good deal. For a while last year, Jose Altuve was the only current Astro that has guaranteed money in 2014, that was not on an entry – level contract. The 2012 ALL – Star had a Career 3 Slash of .285/.323/.377 – with 75 SB and 400 Hits in his 363 Games Played heading into 2014.. Altuve was extended to a 4 YR/$12.5 MIL deal, with two Team Options in 2018 ($6MIL) and 2019 ($6.5). He will be in Houston until 2018 at the minimum. Jose Altuve (23) 2B: Signed by the Houston Astros as an amateur free agent in 2007. Carlos Corporan (30) C: November 29, 2011: Signed as a Free Agent with the Houston Astros. He had 7 HRs and 20 RBI in 191 AB during the 2012 year. Matt Dominguez (24) 3B: July 4, 2012: Traded by the Miami Marlins with Rob Rasmussen (minors) to the Houston Astros for Carlos Lee. Rob Rasmussen (25) SP: December.19, 2013: Traded by the Astros to the Dodgers for Joe Ely. John Ely (27) SP: November 19, 2013: Released by the Houston Astros. Carlos Lee (37) OF/1B: November 24, 2006: Signed as a Free Agent with the Houston Astros. Lee only played a few months for the Marlins before retiring, so I would say this worked out fantastic. Dominguez clubbed 21 HRs and added 77 RBI in his 1st full year for Houston in 2013. Robbie Grossman (24) OF: July 24, 2012: Traded by the Pittsburgh Pirates with Colton Cain (minors) and Rudy Owens (minors) to the Houston Astros for Wandy Rodriguez. Wandy Rodriguez (35) SP: Signed by the Houston Astros as an amateur free agent in 1999. Colton Cain (23) SP: Still with the Corpus Christi (AA team) in 2014. Rudy Owens (23) SP: With Oklahoma City Redbirds (AAA team) in 2014. The Astros still had to eat a significant amount of Rodriguez’s salary, but when your team payroll is not hurtful, then who cares. Grossman has struggled in 2014 – after faring much better in 2013. Rodriguez has gone 11 – 10, with a 3.81 ERA for Pittsburgh so far, but has been hurt for the greaterlast part of a calendar year. L.J. Hoes (24) RF: July 31, 2013: Traded by the Baltimore Orioles with John Hader (minors) and 2014 round A competitive balance pick to the Houston Astros for Bud Norris. Bud Norris (29) SP: Drafted by the Houston Astros in the 6th round of the 2006 amateur draft. Josh Hader (19): Played in A Ball in 2013 for the Astros. Bud Norris was a solid contributor to the Astros for several years, but Hoes can play too. He is cheaper, under team control for way longer. Norris is 4 – 4, with a 5.17 ERA thus far in Baltimore. Hoes has a .729 OPS in 180 AB for his Houston Career thus far. Marwin Gonzalez (25) 2B/SS/3B: December 8, 2011: Traded by the Boston Red Sox to the Houston Astros for Marco Duarte (minors). Marco Duarte (27) SP: Duarte hasn’t played for the BoSox in the Majors. 2011/12/08, Selected by the Houston Astros from the Colorado Rockies in the Rule 5 Minor League Draft. Gonzalez is a good utility guy for a guy that is not in the MLB yet is good. He has only mustered a .226/.264/.320 slash line with the Astros in parts of 3 seasons. Jesus Guzman (29) 1B/PH/PF: December 18, 2013: Traded by the San Diego Padres to the Houston Astros for Ryan Jackson. Ryan Jackson (25) PH/2B/3B: November 20, 2013: Selected off waivers by the Houston Astros from the St. Louis Cardinals. Too early to tell on this one, although you have to like the power potential from Guzman. Jonathan Villar (22) SS: July 29, 2010: Traded by the Philadelphia Phillies with Anthony Gose and J.A. Happ to the Houston Astros for Roy Oswalt. Roy Oswalt (36) SP: Drafted by the Houston Astros in the 23rd round of the 1996 amateur draft. Final Game: September 29, 2013 (Age 36). J.A. Happ (31) SP: July 20, 2012: Traded by the Houston Astros with David Carpenter and Brandon Lyon to the Toronto Blue Jays for a player to be named later, Asher Wojciechowski (minors), Carlos Perez (minors), David Rollins (minors), Joseph Musgrove (minors), Francisco Cordero and Ben Francisco. The Toronto Blue Jays sent Kevin Comer (minors) (August 16, 2012) to the Houston Astros to complete the trade. David Carpenter (28) RP: August 19, 2010: Traded by the St. Louis Cardinals to the Houston Astros for Pedro Feliz and cash. Pedro Feliz (38) 1B/3B/LF: December 10, 2009: Signed as a Free Agent with the Houston Astros. Brandon Lyon (34) RP: December 12, 2009: Signed as a Free Agent with the Houston Astros. Ben Francisco (32): OF: August 31, 2012: Traded by the Houston Astros to the Tampa Bay Rays for a player to be named later. The Tampa Bay Rays sent T.J. Geith (minors) (September 21, 2012) to the Houston Astros to complete the trade. Asher Wojciechowski (25 SP): Started 21 Games for AAA Oklahoma last year. Carlos Perez (23) C: Will start the year Catching for the AAA Redbirds. David Rollins (24) SP: Has started one game for Corpus Christi in 2014 already. Joseph Musgrove (21) RP/SP; Played in the Rookie League Gulfport for Houston last year. Francisco Cordero (38) RP; September 10, 2012: Released by the Houston Astros. He had a 19.8o ERA after 5 IP. Anthony Gose (23) OF: July 29, 2010: Traded by the Houston Astros to the Toronto Blue Jays for Brett Wallace. 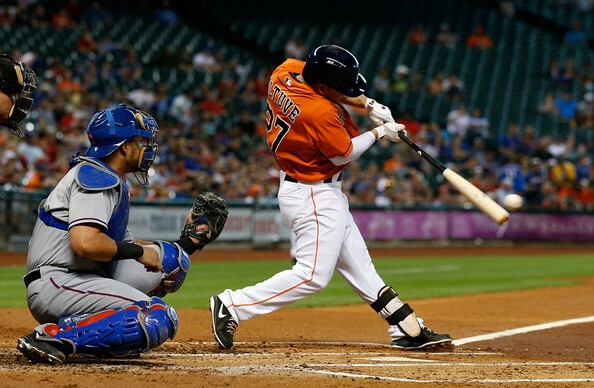 Brett Wallace (27) 1B: March 12, 2014: Released by the Houston Astros. He held a .242/.313/.391 slash line of the Astros, with 29 HRs and 102 RBI in 971 AB. Gose is .240/.294/.361 with 19 SB with Toronto, but he is hardly worth missing for Houston, even if they don’t have an asset anymore for the deal. Kevin Comer (21) SP/RP: Played last year in the New York Penn League For Tri-City. Theron Geith (T.J) (24) RP: He played 13 games for Corpus Christi. J.A. Happ is 8 – 9, with a 4.60 ERA for the Jays thus far. Carpenter is a nice bullpen arm, but never did this with Toronto. Ben Francisco hasn’t amounted to much since departing, and Brandon Lyon keeps team jumping with bad results. Francisco Cordero hasn’t returned to the MLB yet either. Meanwhile you have 7 pieces in your Minor League System.. Not bad. Losing Oswalt was hard, but not having to see him struggle in your uniform ever is a good thing. Alex Presley (28) OF: March 27, 2014: Selected off waivers by the Houston Astros from the Minnesota Twins. Marc Krauss (26) LF/PH/DH: July 29, 2012: Traded by the Arizona Diamondbacks with Bobby Borchering (minors) to the Houston Astros for Chris Johnson. Bobby Borchering (23) 1B/OF: This guy has had some AB for Quad Cities of the Midwest League. 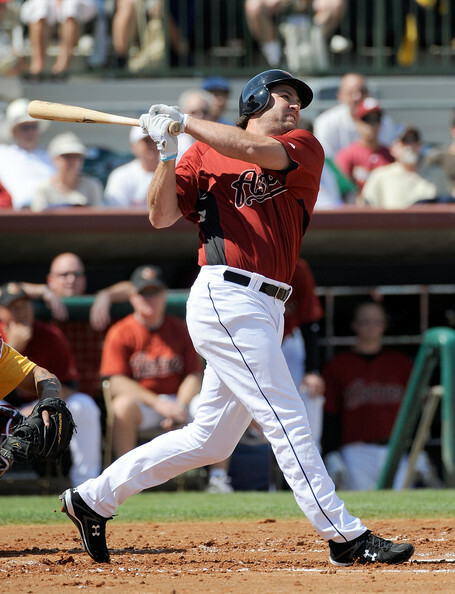 Chris Johnson (29) 3B/1B: Drafted by the Houston Astros in the 4th round of the 2006 amateur draft. This one doesn’t look so great for the Astros with Johnson almost chasing down a NL Batting title last year. At least it wasn’t for the D’Backs. Jonathan Singleton (22) 1B/LF: July 29, 2011: Acquired by the Houston Astros with Jarred Cosart and Josh Zeid. plus a player to be named later from the Philadelphia Phillies for Hunter Pence, and cash. 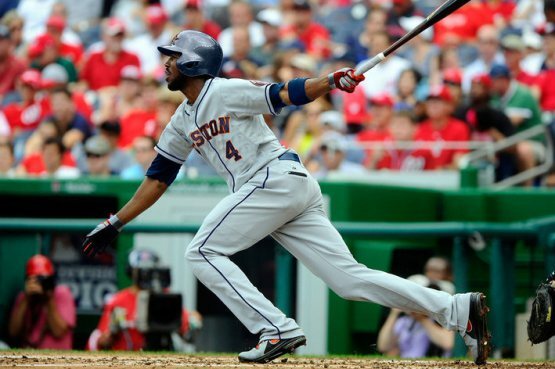 Philadelphia Phillies sent Domingo Santana (minors) (August 15, 2011) to the Houston Astros to complete the trade. Is one of the best players in Houston’s system and is ranked the 57th Best prospect in baseball by Baseball America. Josh Zied (27) RP: posted a 3.90 ERA in 27.2 IP with the Astros last year, but has started with the AAA team based on the Relief Core Depth. Domingo Santiago (21) OF: Hit 25 HRs and drove in 64 RBI at Corpus Christi this year. Starts the year in AAA this campaign. Jarred Cosart (23) SP: Has a 2.28 ERA in 12 Game Starts for the Astros. You will have to read up more about him in the Pitchers side of the Roster Tree later this week. Hunter Pence (30) OF: Drafted by the Houston Astros in the 2nd round of the 2004 amateur draft. This is a great deal for Houston considering Philly traded him a year later. Join us in a few days when we will feature part 2 of this write-up, the pitchers. 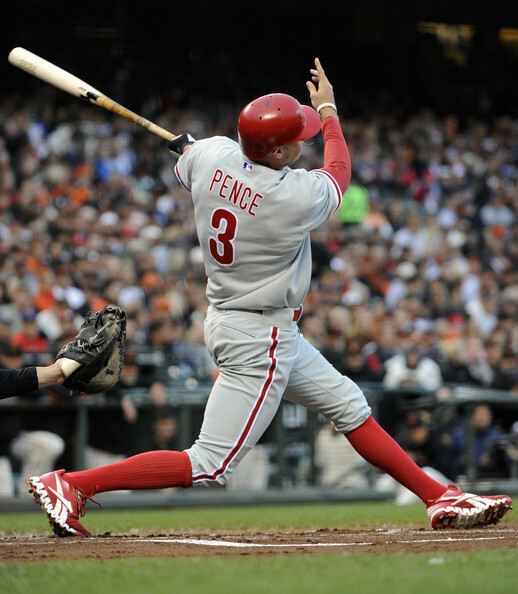 Pence was acquired by the Phillies in 2011, in a deal that could shape the Astros roster for years, with Jonathan Singleton and Jarred Cosart coming back as the key pieces to Houston. Pence hit for a 3 Slash of .290/.339/.479 during his time with the Astros. The cash he just received (5 YRs/$90 MIL) would have been too rich for this team to compete while they were still rebuilding. Posted on April 10, 2014, in MLB Roster Trees and tagged 2014 Pittsburgh Pirates, 25 man roster houston astros 2014, AL West, alex presley, anthony gose, Asher Wojciechowski, ben francisco, Bobby Borchering, brad peacock, brandon barnes, Brandon Belt Marco Scutaro, brandon lyon, brett wallace, bud norris, carlos cororan, Carlos Corporan, Carlos lee, Carlos Perez, chris carter, chris johnson, colorado rockies, colton cain, david carpenter, David Rollins, Dexter Fowler, domingo santaigo, fernando rodriguez, francisco cordero, how all of the Astros were acquired, how many altuves, hunter pence, j.a. happ, jarred cosart, jason castro, jed lowrie, jesus guzman, jimmy paredes, joe ely, jonathan singleton, Jonathan Villar, jose altuve, joseph musgrove, josh zeid, Kevin Comer, kyle weiland, l.j. hoes, lance berkman, Marco Duarte, mark melancon, marwin gonzalez, matt dominguez, Max Stassi, miami marlins, new york yankees, oakland athletics, oklahoma red birds AAA PCL, pedro feliz, pittsburgh pirates, rob rasmussen, robbie grossman, roy oswalt, Rudy Owens, Ryan Jackson, st louis cardinals, Theron Geith, toronto blue jays, wandy rodriguez. Bookmark the permalink. 1 Comment.